Heal your body… Calm the mind… Deeply Relax. A Sonic Massage from head to toe, from inside to outside. Deep nourishment for your Body, Mind and Soul! -Children under 14 years of age. – People who have moderate to severe mental distress/illness. – For anyone with epilepsy. – If you have a pacemaker fitted. – if you are wearing a hearing aid, to turn it off during the sound bath. If you are not sure whether the sound healing is suitable for you, please contact Preet kaur to talk this through. Treat yourself to a course of one to one gong healing sessions tailor made for you. You will receive a full case history and the gong healing will work specifically on what you are wanting help with. To book your private course of sessions, contact Preet Kaur on 07704 636647. A free 15 min Skype or call is available to see if this treatment is suitable for you. Cost of complete training is £600. To confirm your place on the training, 50% deposit is required. To learn how to play the gong is a wonderful gift that brings many blessings for yourself, your loved ones and humanity. 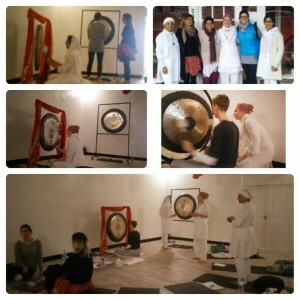 This Training is available for gong novices, yoga teachers or anyone interested in how sound healing with the gong can bring many healing benefits. The training is practical and will give hands on experience in playing the gong for yourself and for others. Level 1 gives you the background about sound healing and the gong, how the gong affects your health, different layers of koshas, chakras and ten bodies, acoustics of the gong, physiology and anatomy of the gong, mallets, positioning when playing. how to approach the gong and you will learn basic strokes on how to invite the gong to play. You will learn any contraindications for sound healing. Level 2: you will learn how to bring the strokes together, you will learn new strokes and the structure of how to give a gong bath. You will also learn how to use the gong in pranayama, relaxation and meditation. Once level 2 is completed, you will need to do 10 case studies working with people you know which will be recorded and part of your assessment to complete the training. 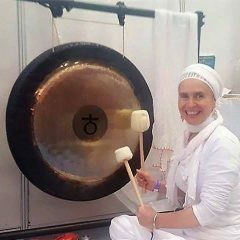 Level 3: You will deepen your skills in intuitive playing and be given practicums and assessments in order to certify as a gong practititioner. "Kundalini Yoga is simply the uncoiling of yourself to find your potential and your vitality and reach your virtues. There is nothing outside, everything is you. You are the storehouse of your totality."